As you may have already discovered, the Windows 10 Fall Creators Update brings with it a totally new touch keyboard for PC users. Much of the work we did was inspired directly by Insiders like you. We’d like to share some details on where your feedback made the biggest impact – and how the new touch keyboard came to life on the Desktop. The touch keyboard on Mobile has long been popular with Insiders and other Windows fans – especially some of the more recent features like Shape writing, one-handed layout and dictation. It wasn’t long before Insiders were asking for these same features on Desktop. But we wanted to do more than simply add Mobile features to the existing desktop touch keyboard. We set out to re-architect our entire platform to create a more consistent user experience across all Windows devices. To do that, we used XAML, our latest (and very extensible and feature rich) UI framework. The complex UI and lightning-fast responsiveness of the touch keyboard made for a challenging development experience. To optimize performance, we worked closely with the teams that owned the XAML framework. We also learned a lot from Xbox. The Xbox team had leveraged the XAML framework for their own keyboard prior to Windows Desktop. While their code base was optimized for Xbox scenarios, we did leverage its basic design. We also performed a lot of low-level tuning within the keyboard to ensure a great typing experience. One-handed touch keyboard: We added a new keyboard that looks similar to a phone keyboard – smaller and more narrow. This lets you hold your laptop or tablet in one hand while you type with the other, for a more comfortable and mobile input experience. Shape writing: Shape writing (a.k.a. Word Flow or Swipe input) is one of the most powerful Windows 10 Mobile keyboard features for faster and more natural one-handed input. It was first introduced on Windows Phone 8.1 and has been tuned to provide the best possible set of predictive texts. The predictive texts are determined using data from multiple sources, including input history data, dictionary probability, and key touch probability. Shape writing has become one of most requested features for Desktop touch keyboards – with feedback coming in multiple languages from Insiders all around the world. Based on this global feedback, we developed shape writing on Desktop for all the languages already supported on Mobile. The result is the first shaping writing experience available on PC! We also made shape writing work with pen, the one-handed touch keyboard layout – and now Windows Eye Control (which empowers people with disabilities to operate Windows using eye-tracking hardware). Prediction: We’ve made a bunch of improvements to our text prediction engine to make it more intelligent. For example, you now don’t need to type anything other than “Text ” to complete the frequently used message, “Text me when you get a chance” using the suggested words. If you’re using a UWP app, you can also now enjoy Emoji suggestions! (The emoji prediction data is shared with Emoji picker. (We will share details about emoji picker in a later Made by You.) 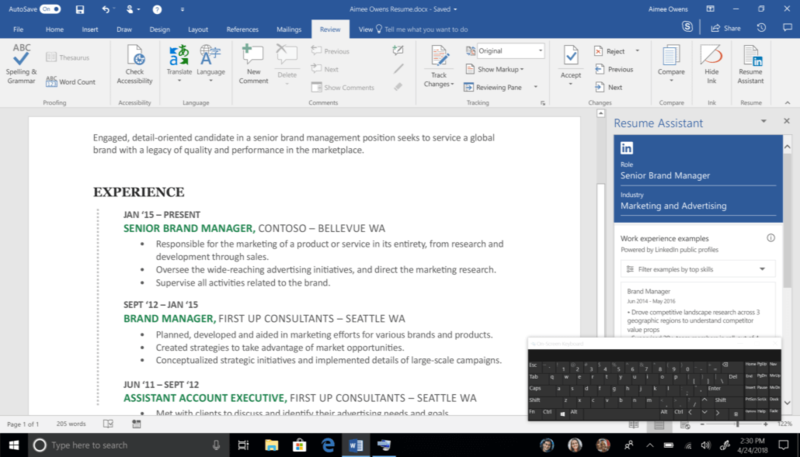 To make all of this happen, we brought the word-class text input intelligence from Windows 10 Mobile to Desktop and worked closely with the team that owns linguistic intelligence behind the keyboard. Dictation: Dictation support on Desktop was another top request. Based on your feedback, you can now use dictation to input English text on desktop for both tablets and PCs (available on the English-US keyboard). Simply tap the microphone button in the top left corner of the touch keyboard or handwriting panel, or press the new dictation hotkey Win + H to start dictating. Besides dictating text, you can also use voice commands to edit text, select or delete a word, move the input cursor and input punctuation. Japanese Curve-flick input: Curve-flick input is an advanced method for quickly inputting Japanese voiced, semi-voiced consonants and Yoon Kana characters – replacing multiple taps/flicks with a single stroke. For example, to input Japanese “び”, simply tap and hold the “は” key, drag your finger to the left and then flick to the left obliquely upward direction. You can even operate this stroke quickly without waiting for petal/sub petal keys to open. Curve-flick input has been available for some time on Windows Mobile. As our Japanese users wrote on social media: “Curve-flick input is awesome!”, “MS should support it on Windows PC”, “I want Curve-flick input feature on any platform”. Now you can use it with the Japanese one-handed Kana keyboard layout on PC, too. The channels that provide us with the best feedback are the Feedback Hub, System Initiated User Feedback (SIUF) and Quests in the Feedback Hub. We actually consulted all three channels when developing the new touch keyboard. Our developer team often looks at original text in different languages. Even if we don’t know the language, we read an English translation. In our system, your feedback is automatically translated by Bing Translator and stored with original feedback text. Keyboard setting menu pane: If you click the keyboard setting menu button at the top left corner of touch keyboard, it shows one-stop setting panel for all the layout and mode switching as well as shortcut for jumping to language settings. It’s been great working with you on this new touch keyboard – and even better hearing about your enthusiastic feedback on the finished product. We’ve got even more keyboard ideas on the whiteboard for future releases – so keep that feedback coming. And let’s continue to make the best Windows keyboard experience even better!